Tai Chi Association of Australia: Existential Crisis? The Tai Chi Association of Australia (TCAA) was founded in 1999 with an aim to establish a strong national independent organisation for all Tai Chi practitioners in Australia. The top priorities, as stated by the first President of TCAA Dr Paul Lam, were sharing knowledge and skills and member benefits in a form of health funds rebates for tuition fees and national database of Tai Chi instructors / classes. Initially, TCAA strongly supported the “Peaceful Challenge” competition which included Tai Chi, Push Hands and Wushu. The competitions attracted many enthusiasts and were a huge success until HIH Insurance collapse in 2001 and following Martial Arts Insurance crisis. The “Peaceful Challenge” organisers could no longer afford the required insurance for the competition and it was folded forever. The TCAA then organised their own competition but, in order to keep insurance premium low, without Wushu and Push Hands. At that time, the TCAA developed strong affiliation with the Australian Kung Fu (Wushu) Federation which was the National Sporting Organisation (NSO) for Wushu and Kung Fu. This was the beginning of converting the TCAA into a submissive envoy to the AKWF recruiting members to boost the AKWF numbers and customers for the AKWF/MAIA insurance. The TCAA Annual Competitions had to be “sanctioned” by the AKWF and all instructors were forced to undertake the NCAS accreditation course. The loss of independence was however met with great excitement which gradually transcended into apathy. 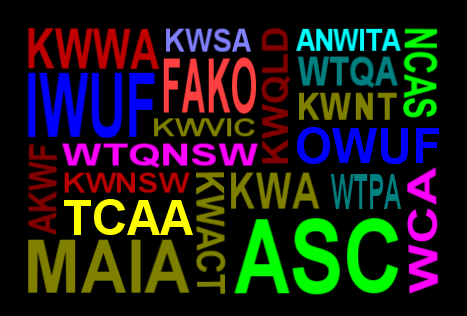 As a matter of fact, some TCAA members, especially from good old days, simply believe that they have nothing to do with the AKWF or Kung Fu Wushu Australia. at any General Meeting to which they are invited to attend, has the right for its Representative to be heard on any subject under discussion. However, if the TCAA President is not aware of the Kung Fu Wushu Australia being a new organisation, it is highly unlikely that the TCAA even applied for its humiliating membership. Access to National and International Competitions sounds like a great benefit but is it worth losing independence? It is important to understand that MAIA accreditation is officially different from NCAS accreditation. Although MAIA was officially derecognised by the Australian Sports Commission, its accreditation is still sometimes perceived as approved by the government. While the Kung Fu Wushu Australia may still have a valid NCAS involvement inherited from the AKWF, the instructors awarded with that “magic card” supposedly opening all doors ahead should not be seen as “government accredited”. The Australian Sports Commission’s officials, on many occasions, clarified that “the Government does not accredit any instructors. You are an AKWF-accredited instructor”. The Kung Fu Wushu Australia’s approach to insurance as a requirement for membership / accreditation has been evolving: see their Membership & Insurance Policy. A relatively reasonable requirement to have an insurance for a particular amount in 2010-2012 has been finally developed into an exclusive deal when members MUST buy insurance from a particular insurer. It is not clear what is more amazing: the boldness of the Kung Fu Wushu Australia or spinelessness of the TCAA happy to support such an aggressive practice by encouraging its own members to abandon their freedom of selecting their insurance based on their own interests, not the interests of the “peak body”. Indeed, not being a governing body, accrediting body or supporting and protecting body for its members poses the difficult existential question for the TCAA. What is its purpose apart from being a loyal voiceless agent supplying unsuspecting members/customers to the national monopoly?